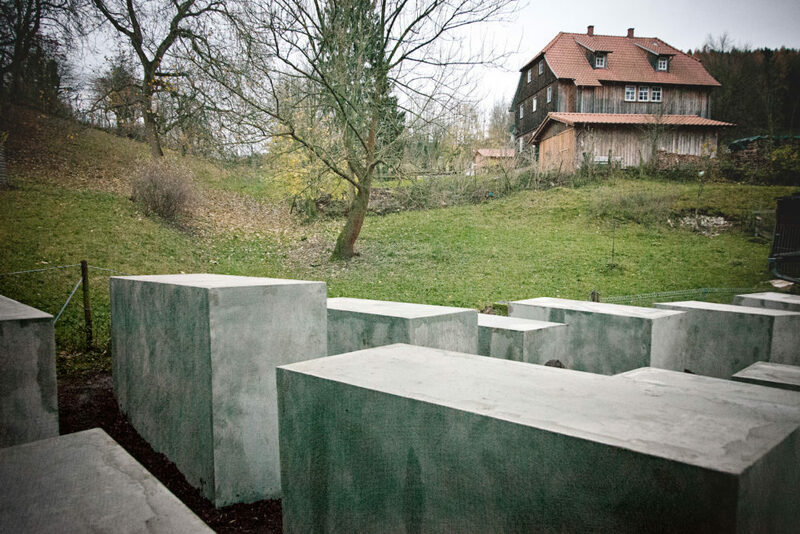 Replica of the Holocaust Memorial in front of Bjorn Höcke's home in Bornhagen, Germany. Photo: Center for Political Beauty. The prosecutor’s office in Gera, in the German state of Thuringia, has closed an investigation into artist Philipp Ruch, the founder and head of the artist collective the Center for Political Beauty, following a public outcry, the New York Times reports. The legal inquiry was launched in 2017, after the artist built a replica of the Holocaust Memorial in Berlin next to the home of the far-right politician and Alternative for Germany (AfD) party member Björn Höcke, but Ruch did not know he was being investigated until earlier this year. Ruch, along with other members of the Center for Political Beauty, re-created the memorial after Höcke infamously criticized the monument at a 2017 political rally. Höcke said Germans were “the only people in the world to plant a monument of shame in the heart of its capital,” and that they had the “mentality of a totally vanquished people.” When the structure was completed, Höcke endeavored to sue the artist and unsuccessfully tried to initiate criminal proceedings against him. Höcke’s attempts to evict Ruch may have led the prosecutor’s office to take action. Höcke claimed that a series of performative actions carried out by the collective, such as the staging of a fake spy room, which was open to the public, were evidence that the artist was spying on him. Ruch was being investigated on suspicion of “forming a criminal association,” and under the legal provision Paragraph 129, which is typically applied to criminal groups and terrorist organizations, the state could legally surveil the artist and his collaborators. The move raised concerns over whether right-wing sympathizers were using the law to suppress critical political views. Lead prosecutor Martin Zschächner had denied that the investigation was politically motivated, but it was later discovered that he had made a small donation, about $34, to the far-right AfD party after the investigation was opened. The Süddeutsche Zeitung also reported that Zschächner had dismissed complaints against an AfD politician who had made racist comments against Africans and Arabs. The lawmaker was accused of inciting hatred against specific groups. Last week, 145 German cultural figures, including lawmaker and former Green Party leader Cem Özdemir and popular singer Herbert Grönemeyer, signed an open letter against the “criminalization of critical art” and demanded that those involved in the investigation disclose their political affiliations and issue an apology and an explanation.